Mara Tagarelli is on top of her world. She’s the head of a multimillion-dollar AIDS foundation, an accomplished martial artist, and happily married. Then, in the space of a week, her wife leaves her, she is diagnosed with multiple sclerosis, and she loses her job. Mara has never met a problem she can’t solve—until suddenly she can’t solve any of them. Everything begins to feel like a threat. At first, she thinks it’s just her newfound sense of vulnerability. Then she realizes the threat of violence is real, deadly, and imminent. But how do you defend yourself when you can’t trust your own body? How do you face down danger when others believe you are helpless, yet you know monsters are coming? This will be a fight unlike any Mara has faced before. 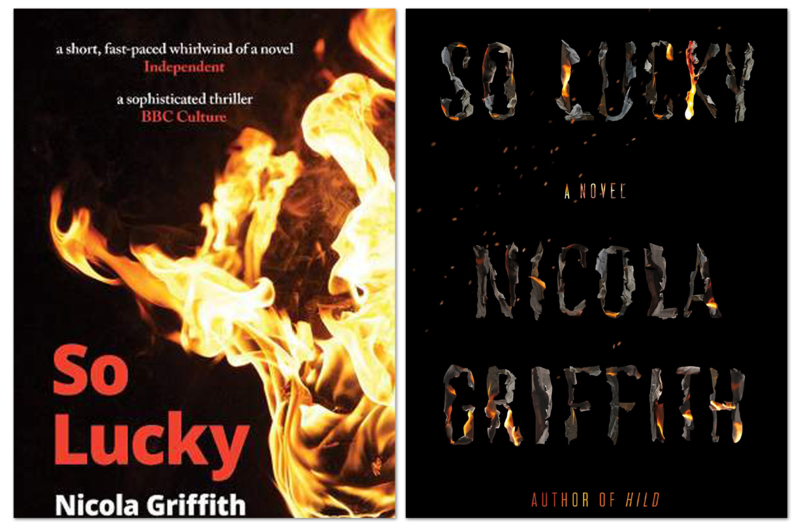 Nicola Griffith’s So Lucky is fiction from the front lines, incandescent and urgent, a narrative juggernaut that rips through sentiment to expose the savagery of the experience of being disabled and chronically ill in America. Yet So Lucky also blazes with the hope and authority of the life that becomes possible when we stop believing lies, find our strengths, and learn new ways to fight. Teaser 2 for cover reveal. Teaser 1 for cover reveal.